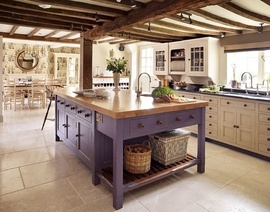 Kitchen islands should be in proportion with the rest of the space, and there should be plenty of space to walk around it. Inexpensive options for a kitchen island are freestanding worktables or rolling carts, at about $200. Built-in islands can range from $600 to over $5,000.